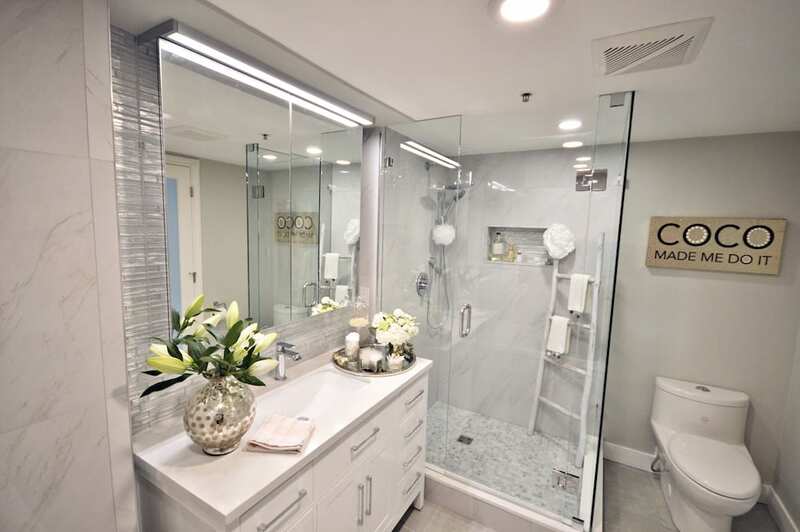 This principal bathroom was transformed to showcase an expanded shower and an updated, tranquil aesthetic with modern fixtures and finishes. The bathroom’s vanity area was redesigned to include a 48” wood cabinet in a white painted finish with 8 soft-closing drawers and 2 doors topped with a 2cm quartz counter in a faux Carrara finish and paired with a porcelain undermount sink and single post faucet. 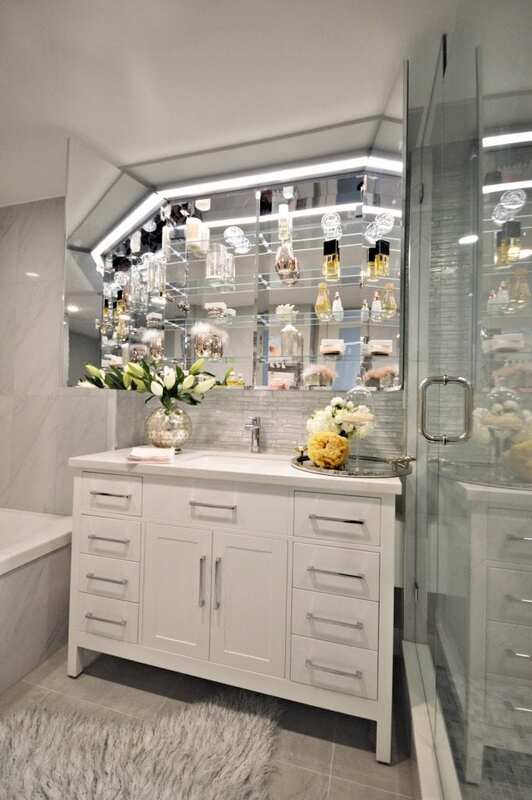 A complete wall of linear antique finish glass tile is featured above the newly installed vanity while a shallow mirrored medicine cabinet graces the space above the vanity in place of a traditional mirror. This inclusion offers the advantages of a traditional mirror while increasing storage options and functionality in a compact bathroom. 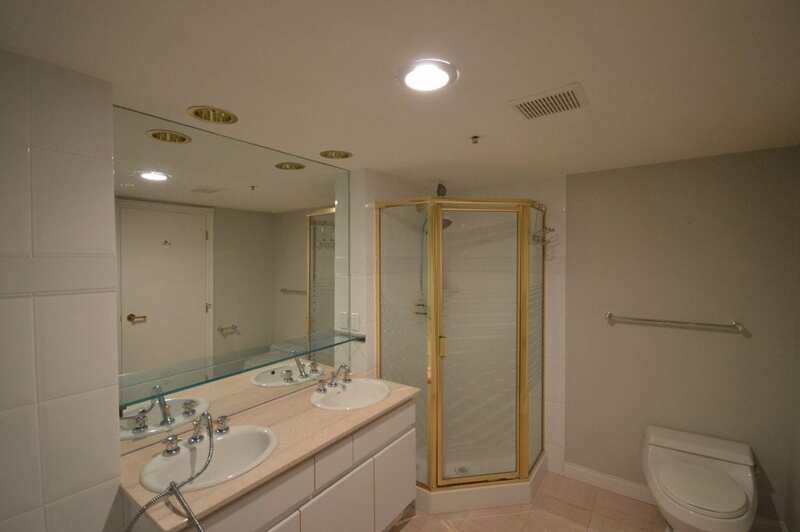 The original Jacuzzi bathtub was retained, with the area being treated to a fresh makeover of a combination of 12” x 24” and 24” x 24” faux marble porcelain tiles, and the existing brass faucets replaced with new fixtures. An expanded 40” x 50” shower was constructed using Schluter components including a stainless steel drain and Kerdi waterproofing over the shower pan and walls. A custom 10mm tempered glass enclosure was installed with a hinged door for easy access. The shower walls were tiled in a 12” x 24” faux Carrara porcelain while the shower floor was finished in a Carrara marble basket weave, and a tiled wall niche for product display and storage was incorporated. As an added nicety, a wall-mounted towel warmer was installed and connected to a digital 15 minute to 4 hour countdown timer. 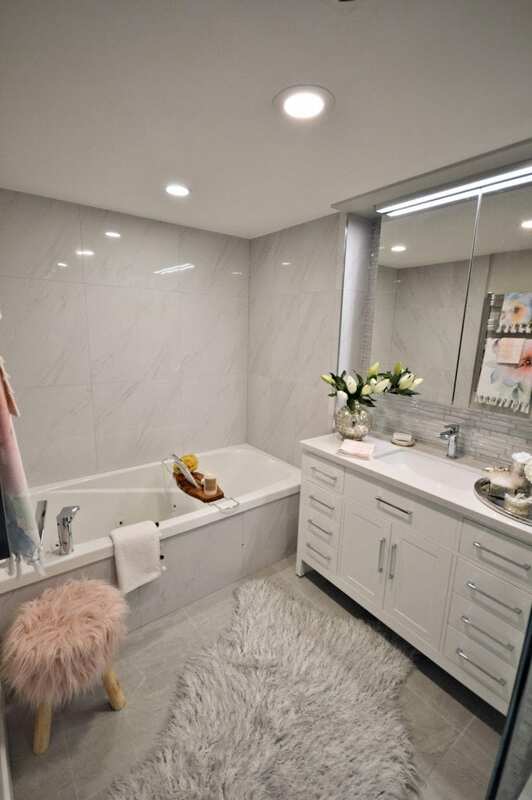 With a welcome wash of calming whites and heavenly greys, the enthusiastic infusion of moody marble and graceful porcelains, and the effervescent pop of shimmering metallics, this bathroom renovation surely delights at every turn!